Take a look around your garage. Is the space as organized as the rest of your home? If you scoff at this question, you’re not alone. Many homeowners avoid the garage like the plague because the disorderly mess is a source of stress in their lives. Take a moment to assess your garage with a critical eye. Where could you possibly add more storage to eliminate clutter without getting rid of your belongings? Just look up. 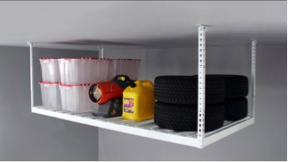 Overhead storage is an often forgotten garage organization solution. The floors and walls are overcrowded, but the area near the ceiling is untouched. Ceiling-mounted storage could be just the solution you need. Why is Overhead Storage Ideal? It’s true that overhead storage puts items out of arm’s reach, but that’s not a huge inconvenience when you’re storing items you only use once a year or less. Fill bins with seasonal decorations and summer sporting equipment, and label them accordingly. Throw spare tires, camping gear and luggage up there as well. These items may not get frequent use, but it’s still worth holding onto them. With overhead storage, you eliminate clutter at ground level without getting rid of important seasonal items. How does Overhead Storage Work? Stationary racks are the most common and practical form of overhead storage. They consist of a large, heavy-duty platform mounted to the ceiling. These overhead storage solutions can safely hold up to 400 lbs. Movable racks are also available if you want to avoid climbing a ladder to reach stored items. Manual hand crank cables and pulleys are your first option. These make it easy to raise and lower overhead storage systems to retrieve items. Motorized systems are also available, which are the best option for ultimate convenience. Safety is paramount when it comes to mounting something above your head. To ensure a proper job well done, make sure you leave overhead storage installation to the professionals. By securely mounting the racks to ceiling rafters, you never need to worry about the storage solution coming loose or falling from the ceiling. The installation only takes one to two hours when you rely on the pros to get the job done. Unless you have experience installing similar fixtures, it’s likely the job would take you much longer. Free up your afternoon and put your mind at ease by not attempting the job yourself. Are you looking for other ways to eliminate clutter in the garage? Overhead storage solutions are just the start. Request a free on-site design consultation from Boston Garage to learn more ways to get the most out of your garage.